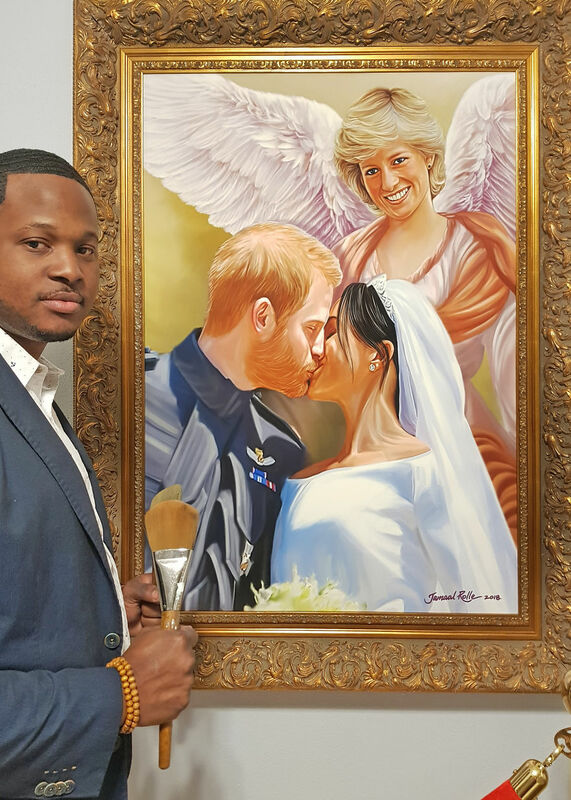 Premier Bahamian ‘celebrity artist’ Jamaal Rolle recently placed brush to canvas to commemorate the Royal Wedding of the now Duke and Duchess of Sussex, Prince Harry and Meghan Markle. The painting entitled “Mother’s Blessing” depicts a heavenly image of the late Princess Diana as she smiles on the new union of her son Harry and Meghan embracing with a kiss on their wedding day. Jamaal Rolle previously met Prince Harry during his visit to The Bahamas on March 4th, 2012, for the Queen’s Diamond Jubilee celebrations. 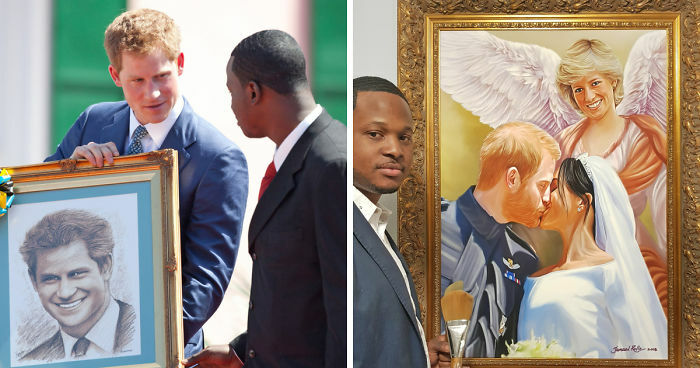 During Prince Harry’s visit, Jamaal presented the young Prince with a portrait that he created. 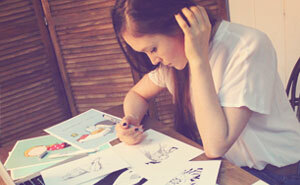 Delightfully receiving the portrait, Prince Harry exclaimed “your work is absolutely brilliant, thank you so much”. “Mother’s Blessing”, as depicted by Bahamian Celebrity Artist, Jamaal Rolle. 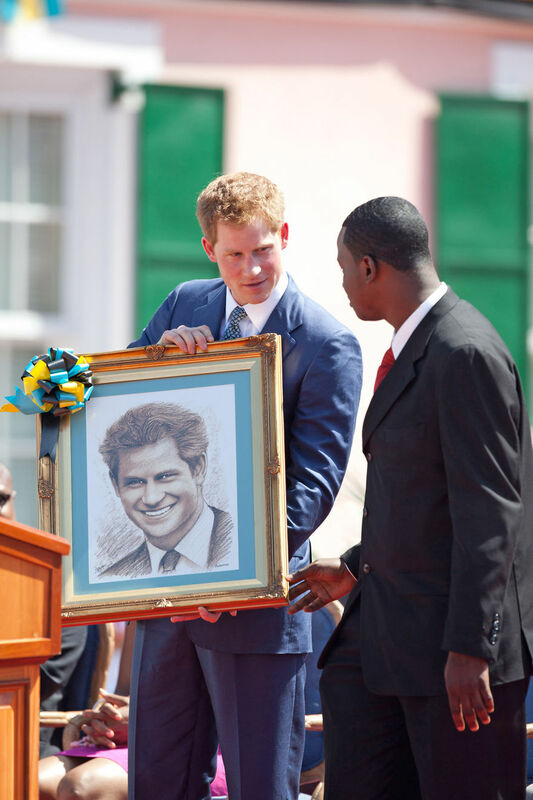 Prince Harry is presented with a portrait by Bahamian Celebrity Artist, Jamaal Rolle during his visit to the Bahamas on March 4th, 2012 for the Queen’s Diamond Jubilee celebrations. Jamaal Rolle is a world-renowned Bahamian “Celebrity Artist”, having painted portraits of many influential figures in history and society. 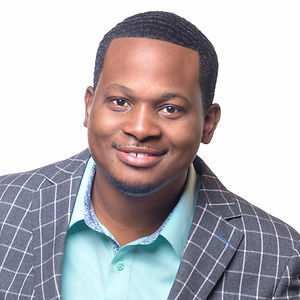 Mr Rolle’s work has been featured in numerous publications and news coverage, such as People Magazine, the Huffington Post, BBC News, Washington Post and CBS News. Diana would so proud of "her boys".